Last modified: April 8, 2019 at 10:15 am by Charles C.
Problem: Scanner NOT accepting Cards. 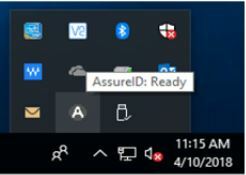 Solution: When this happens, the first thing to check is the AssureID service which can be found in the Windows System Tray (bottom right corner of Windows Desktop). 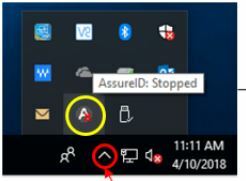 Show below is the AssureID icon (the “A”) in Windows 10. This is the normal condition and should be checked if the card is not scanning or the scanner LED has turned read. After restarting the service, close the IDentiFake application and reopen it. 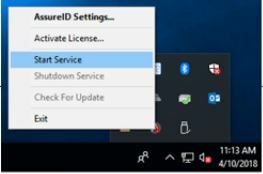 The IDentiFake application needs to communicate with the service and if it is NOT restarted, the cards will scan in the scanner, but no data will show in the application so its necessary to restart the application.